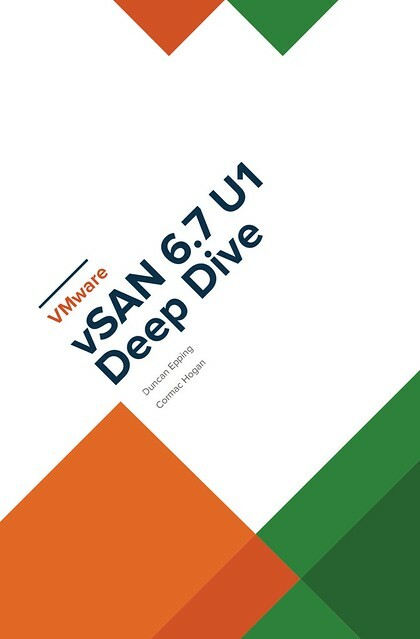 vSAN 6.7 U1 Deep Dive book coming soon! Cormac and I decided to update the vSAN Essentials book. We added a whole bunch of extra info and also decided to rebrand it. “Essentials” did not really cut it, it is much more than that. Considering I just finished the Clustering Deep Dive with Frank and Niels, we figured this could be a nice addition to that series, complementing both the Host Deep Dive as well as the Clustering Deep Dive. We’ve received all the feedback from our reviewers, Frank Denneman and Pete Koehler, and spend various evenings digesting and processing it. Now it is just a matter of adding the foreword to the book, and then we can simply press: Publish. Hopefully, within 2 weeks, I will have a new article that details how you can buy the book! The plan is right now to release the paper copy and the ebook at the same time, we will link the books, so those who buy the paper copy can buy the ebook at a discounted price. We will also make sure the ebook is priced very attractive, as we feel it should be the format of choice for everyone! I’ve been wondering if I should order the old book. In recent years there have been so many great new features missing in it. I am looking forward to it ! Great.. I need this book. Awesome,am waiting for this book. I can see Netherland and Ireland in the cover !! Will you have a lengthy focus on vSan strech cluster? There already is a very lengthy doc on storagehub.vmware.com, but we will cover it as well.